​​Type I Portland Cement is light gray and suitable for general and cold weather concrete construction, applications requiring early strength, masonry units and mortars, and where the special properties of other types is not required. ​Type II Portland Cement is dark gray and suitable for general and warm weather concrete construction, masonry mortars, and applications where lower heat of hydration or increased sulfate resistance is required. White Portland cement is similar to ordinary gray Portland cement in all aspects except for its high degree of whiteness. ProMasonry Type N Light Premix Mortar is used for laying brick, block, and stone, or for pointing, plastering, and stuccoing. It is lighter in color compared to Type S Mortar. ​Iron Clad Type S is masonry mortar suitable for exterior walls at or below grade, masonry pavements, walkways, and patios. 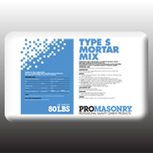 ​ProMasonry Type S Premix Mortar is a blend of masonry cement and sand, designed for professional use. All ProMasonry products are processed through precision blending equipment to ensure a consistent product of superior quality. Quikrete Mason Mix is a is a high strength Commercial Grade dry pre-blended mixture of sand and cements specially selected for masonry applications. Meets N, S, M requirements as specified in ASTM C270. ProMasonry High Strength Concrete Mix is a quality blend of Portland cement, graded sand, stone/gravel and other ingredients. It is designed to be used in applications at least 2 inches thick. Especially designed for structural and load bearing applications including footings, foundations, slabs and for anchoring posts or supports. ​Ardex X5 is a versatile, polymer-modified, tile and stone mortar for setting porcelain, quarry, ceramic and most natural stone* tiles over common interior surfaces, including exterior-grade plywood, as well as exterior concrete and masonry surfaces.